There are two artists who have used this name 1. New Edition is an American Pop/R&B group formed in Boston, Massachusetts in 1978, that was most popular during the 1980s. Guided by producer Maurice Starr, New Edition was originally a Jackson 5-esque collection of five young African American teenage singers, including lead singers Ralph Tresvant and Bobby Brown, and vocalists Ricky Bell, Michael Bivins and Ronnie DeVoe. 1. New Edition is an American Pop/R&B group formed in Boston, Massachusetts in 1978, that was most popular during the 1980s. Guided by producer Maurice Starr, New Edition was originally a Jackson 5-esque collection of five young African American teenage singers, including lead singers Ralph Tresvant and Bobby Brown, and vocalists Ricky Bell, Michael Bivins and Ronnie DeVoe. The group was notable for #1 singles such as "Cool It Now," "Candy Girl," and "Mr. Telephone Man" and their success led to the creation of late-1980s and 1990s boy bands like New Kids on the Block, The Backstreet Boys, and 'N Sync. Like the Jackson 5 before them, New Edition became a pop phenomenon, and were big enough to have Madonna as an opening act during their early days. 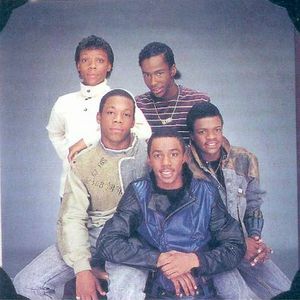 The group parted company with Starr in 1984; Starr responded by promptly creating the group New Kids on the Block, essentially New Edition with Caucasian teenagers. After the split the boys still received success from singles such as "Cool It Now, Mr. Telephone Man", and "Count Me Out". Around 1986, Bobby Brown was voted out of the group, due to behavioral problems during concerts, He went on to pursue a solo career in 1987 but did not find success in his solo ventures until 1988. Brown was replaced by former solo child star Johnny Gill who would become an official member that same year. The group's sound also evolved at this time from bubblegum pop-styled R&B to smoother, more adult music. The new material, primarily produced by Jimmy Jam & Terry Lewis, had a strong new jack swing feel. The first album recorded with Gill, Heart Break, had numerous R&B hits, including "If It Isn't Love", "Can You Stand The Rain", "N.E. Heart Break", and "Boys To Men" (which later lent its name to the Philadelphia-based group Boyz II Men). New Edition essentially broke up in 1989, with Bell, Bivins, and DeVoe forming the popular hip hop group Bell Biv DeVoe, Ralph Tresvant beginning his solo career and Gill restarting his solo career, with more success this time. In 1991, the group had a semi-reunion of sorts when they recorded a remix of the Bell Biv DeVoe track "Word To The Mutha!" in which all six members performed and appeared in the music video. In 1996, the reunion became complete, as all six former members reunited for the Home Again album. Although the album featured the hit singles "Hit Me Off" and "I'm Still In Love With You", the ensuing tour would prove disastrous for the group. By the middle leg of the tour in 1997, Bobby Brown and Mike Bivins left, due to egos clashing and a less-than-harmonious time with the other members. The band canceled the tour and went on indefinite hiatus soon afterward. The band reformed again in 2002 without Bobby Brown and released an album on Bad Boy Records entitled "One Love". They are currently working in the studio with plans to release another album with all six members in 2008. 2. The first New Edition was a British boy/girl eleven piece pop rock dance troupe that formed in 1975. They had one Top five hit in the UK with ?Summertime City? credited as the backing band for Mike Batt. The band also recorded an album called ?Sunshine Saturday?, the title track which was eventually used as the theme song for the BBC light entertainment summer series ?Seaside Special? held in various coastal locations in Britain and featuring several celebrities and top rated bands and solo singers of the day. They also recorded a couple of other singles including ?Get A Bit Of Sand Between Your Toes? written by Tony McAulay, but they did not have hits with them. Aside from the album and aforementioned singles, there is no other information available about this act.